The Taj Mahal, Agra’s near four-century-old monument to love, is beginning to show its age. Air pollution is turning its ivory-white surface yellow. The heavily contaminated river Yamuna, on the banks of which the Taj sits, is a breeding ground for insects that leave green patches on its marble domes. 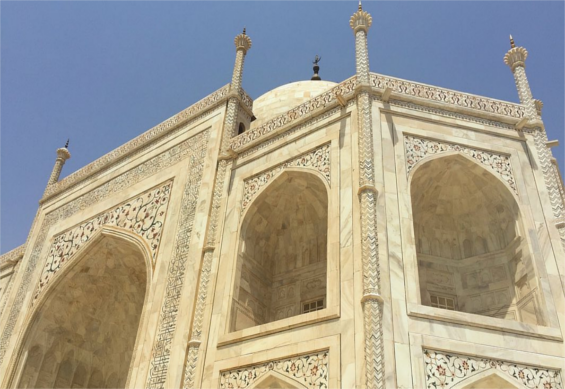 The past two years have seen a flurry of restoration work to the monument, built in 1631 by the Mughal emperor Shah Jahan, as a tomb for his favourite wife, Mumtaz Mahal. Scaffolding around the outer minarets was prominent in the background of photographs when the Duke and Duchess of Cambridge visited India in April 2016. Less clear from a distance is the precise treatment being used to clean the modern wonder: mud packs, similar to those slapped on faces around the world, and in pursuit of the same youthful effect. Work on the dramatic main dome was meant to have started last month – not something those here for the once-in-a-lifetime view would relish – though this has been postponed. Officials now say the dome won’t be covered until the end of 2017 at the earliest, as during the summer the mud dries too quickly and will not clean so effectively. Bhuvan Vikrama, a superintendent with the Archaeological Survey of India (ASI), said the treatment consisted of applying Fuller’s earth – a clay traditionally used to clean marble – to the entire structure of the Taj. The clay forms a thick paste that absorbs dirt, grease and animal droppings, and is washed off with distilled water, leaving the surface relatively pristine. The process is time-consuming, however. “We do this in pieces, in small patches. 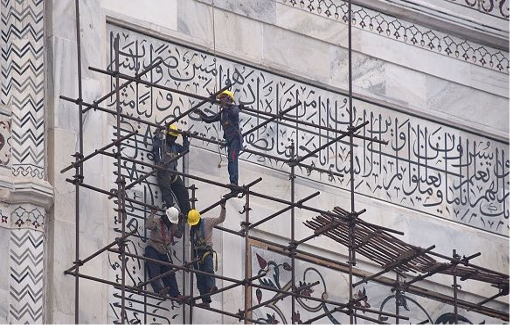 So far, we have completed three minarets and three vertical surfaces,” Vikrama said. Tourism operators have expressed concerns the treatment might affect tourist demand – India’s most famous monument receives eight million visitors a year, but Vikrama insisted it’s business as usual. “A small portion of one side is covered and cleaned, then we move on to the next portion. So the entire monument won’t ever close. It will be open as normal for tourists,” he said. It is inevitable, however, that some tourists will be unlucky timing their visit with the treatment of the main dome, and scaffolding will be a persistent feature until at least next year. But there is no question that treatment needs to go ahead, and the long-term benefits of the clean-up outweigh any short-term disappointment. “There’s a marked difference between the untreated and the treated areas,” Vikrama said. 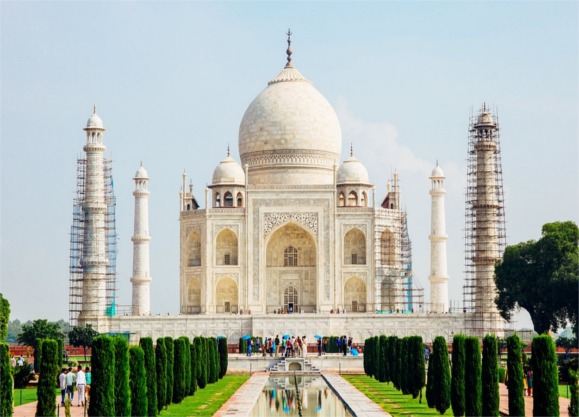 He declined to comment on the cost of the project, but said the Taj had become increasingly expensive in the past decade, in part because of the crushing impact of the millions of tourists walking the site each year. In August the ASI proposed to limit viewings to a maximum of two hours per day, but the measure is yet to be implemented.